The relationship between insulin and weight loss is much more important than most people realize. By controlling your insulin you can make it much easier (and tastier) to lose weight. WARNING: Thar' be science ahead! Moves the blood sugar (glucose) into your muscles, so that they will have plenty of energy when called on. If you workout all the time, then when you eat, you're refilling your muscles' glycogen stores. After filling your muscles, insulin stores the rest of your blood sugar as fat for later use. Now, a certain amount of insulin release is natural. But (as you might have guessed) what most people eat is far from natural. Eating foods that are packed with quickly digested carbohydrates that cause blood sugar spikes (like cookies, sugary cake, and delicious ice cream) also cause insulin spikes. And these insulin spikes mean that those extra calories will be stored as fat. When your insulin levels are high, that stops your body from using fat as a fuel source. The reason is that if your insulin levels are high, then you have far too much sugar in your blood anyway and you don't need to use fat for energy. You can just save it for later, and use your blood glucose now. On the other hand, when your insulin levels are low, you can more freely utilize fat because your body is feeling the crunch and needs energy. So keeping insulin levels low really helps your efforts to burn fat. And to avoid putting on more. In your diet, carbohydrates cause your body to secrete insulin. If you control your carbs, you control your insulin. Protein and fat cause much lower levels of insulin to be released, making them much healthier to eat than carbs. This is the real reason that eating cookies and sweet things make you put on so much fat. They elevate your insulin levels and promote fat storage. "Carbohydrate is driving insulin is driving fat." 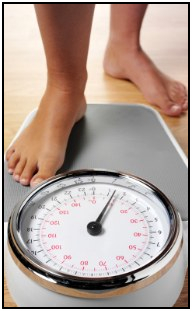 So, by controlling your carbohydrate intake, you can make it much easier to lose weight. Or much harder to gain it. On the most basic level this means staying away from simple carbohydrates. Cookies, cakes, jam, and other food items with obviously high levels of sugar and high-fructose corn syrup are out. And staying away from refined carbohydrates (which generally have a high glycemic index) is good, too. Foods like pasta, white bread, and white rice should be eliminated or eaten in moderation for controlling insulin and weight loss. Exercise also helps you control your insulin. And, thus, lose weight. Increases your muscles sensitivity to insulin. Emptying your muscles of glycogen means than when you eat carbs, and the carbs cause insulin to be released into your body, your body stores blood sugar in your muscles instead of in fat. And regular exercise makes your muscles more sensitive to insulin so that your body releases less insulin to store blood sugar in your muscles - which means less insulin to potentially store blood sugar as fat. Simply, your body doesn't have the ability to really metabolize grains yet. Humans only started eating them around the time of the agricultural revolution, about 10,000 - 12,000 years ago - pretty late in terms of evolutionary history! Grains have the major advantage of being easily produced in bulk and that being able to feed lots of people. But they generally cause high levels of insulin production, and nutritionally they aren't very helpful - which is the reason they are fortified with minerals and vitamins. So, for controlling insulin and weight loss success, remove most grains from your diet. Eat lots of leafy green vegetables. These guys are nutritious and don't have many calories per serving. Just say, "Yes!" to meat, eggs, fish, and poultry. Eat moderate amounts of fruits for your sweet tooth, but don't go overboard. Another bonus of eating more protein and fats is that they're filling and satiating. Eating more of them will make you feel 'full' faster. So you'll be eating in moderation. But these are just general guidelines. Check out this more comprehensive info about healthy foods to eat for a better idea of what to chow down on to control insulin and weight loss, and for just being healthy. You might notice that this diet is similar to the primal diet, a paleolithic diet, or simply a low glycemic index diet. This is by design - all those diets are also aimed at insulin control to accelerate fat loss. Of course, even if you're eating to achieve healthy insulin and weight loss, you have to remember that if you eat excessively you'll still gain weight. Sitting on the couch eating avocados and bacon all day is a tiny step forward for insulin control, but you'll still get fat. You still need to eat just 'till you've had enough, and still have a calorie deficit - not 'button-bursting' full. But a healthy diet that controls your insulin production, along with some good intense exercise, is a great place to start. When you have your insulin and weight loss efforts working together, that will reallyaccelerate your efforts to lose weight. • Click here to leave 'Insulin and Weight Loss: Or, Why Your Diet Won't Work' & go back to the Home-page! 1. De Vany, Arthur. 2011. The New Evolution Diet: What Our Paleolithic Ancestors Can Teach Us About Weight Loss, Fitness, And Aging. Emmaus, Pa: Rodale. Pp. 85. 2. Taubes, Gary. 2008. Good Calories, Bad Calories: Fats, Carbs, And The Controversial Science of Diet And Health. New York: Anchor Books. Pp. 400. 3. De Vany. Pp. 85.